Spiritus says, “Life is a journey. We’re all on it. Everyone’s journey is different; complex and exciting, some more so or less than others, but nevertheless it will chart your path. We will waive the fee for 2 entrants per competition. Just contact us at [email protected] and make the request. ALL entrants work is shown on their own page with their artist statement, website info, bio and parts of their CV. Early entries are featured on N.Y. Photo Curator’s Facebook and Instagram pages. PRIZE DETAILS: First Place winner receives Q&A with curator. Curator reviews first place winner. One or more past curators may contribute reviews as well. 10% of artist fees goes to the first place winner's charity. The first place image shows on our splash page for a month Not eligible to enter? - Find contest where you are. COPYRIGHT: All copyright rights to the photographs remain with the photographer. 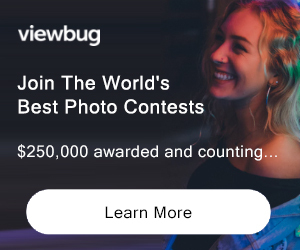 USAGE RIGHTS: By entering, entrants automatically accept the conditions of the competition; they grant L.A. Photo Curator nonexclusive rights to use and reproduce submitted photographs for promotional and competition advertising purposes. No royalties or compensation will be paid for these purposes. We also use your image and info to promote your work at random times on Facebook, Instagram, Twitter, etc.